This post is a follow-on from Part 1 which reported the experiences at the start of the heating season (at the end of November). After a few months of rather colder temperatures and the extraction of a considerable amount of heat from the ground, the Coefficient of Performance figures are still good but somewhat less impressive than before. It’s evident that the temperature of the water coming in from the ground loop has a significant effect on the efficiency of the heat pump and the heat output it is able to deliver. At the end of November the ‘brine’ was typically coming in at 10 degrees whereas now it’s around 5 degrees. With brine at 10 degrees, the 8 kW heat pump was actually delivering 10 kW (as reported by the Kamstrup heat meter) whereas with brine at 5 degrees it’s ‘only’ delivering 8.5 kW. The heat pump experts tell me this is expected behaviour and it’s why an ‘open loop’ heat pump taking water from a lake or river performs better than a ‘closed loop’ unit which circulates the same brine around a closed circuit. In ‘heating’ mode the heat pump attempts to match the heat loss from the house by delivering water into the heating circuits at just the right average temperature. With colder temperatures outside this equates to warmer water, which tends to equate to lower efficiency (although actually the high thermal mass of the house reduces the impact of brief cold spells). During a typical ‘run’ it is still consuming almost exactly 2 kW (just like in November) but delivering 8.5 kW, for a CoP of around 4.25. On cold-but-bright days, the hot water gets heated by the Immersun unit that diverts excess solar PV generation to the immersion heater, which has its thermostat set to 60 degrees. (It does this often enough that I’ve switched off the heat pump’s own anti-legionella sterilization cycle for the hot water tank.) 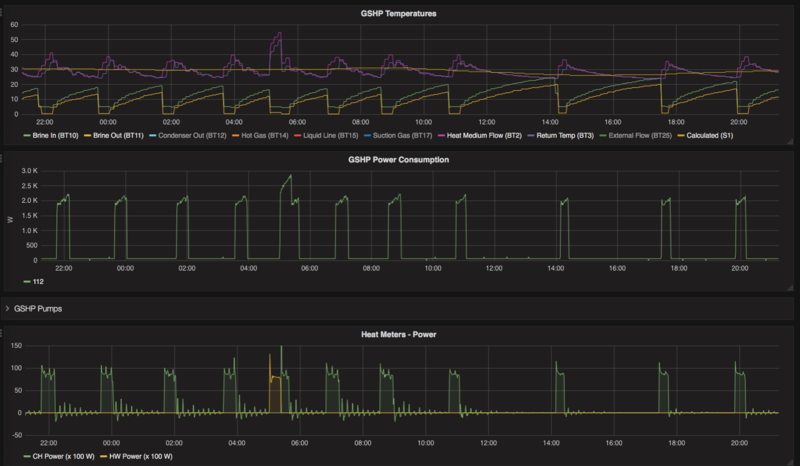 On dull days the heat pump still kicks in to heat the stored hot water to 50 degrees. With the lower brine temperature (5 degrees in, 0 degrees out) it still consumes up to 2.88 kW but wth a reduced power output of 8.0 kW, for a CoP of 2.77. The second set of graphs (below) show a ‘hot water’ cycle starting at around 2018-02-15T05:00. 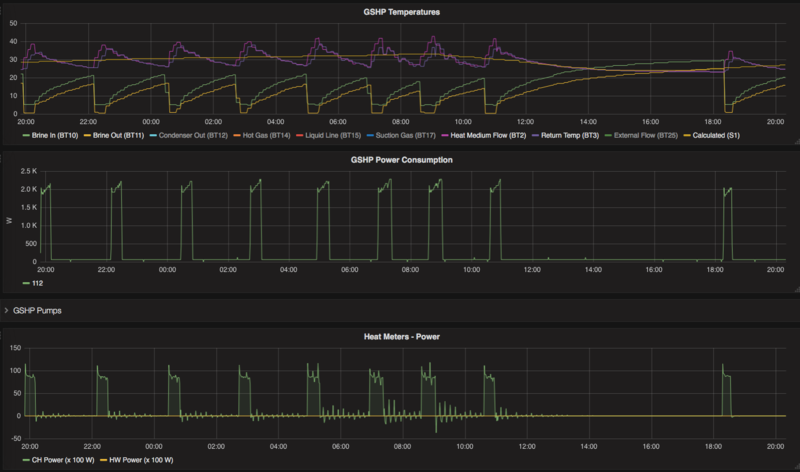 Note how the increased water delivery temperature (peaking at 55 degrees) corresponds to an increased electricity consumption (peaking at 2.88 kW) while the power output remains steady at 8.0 kW.